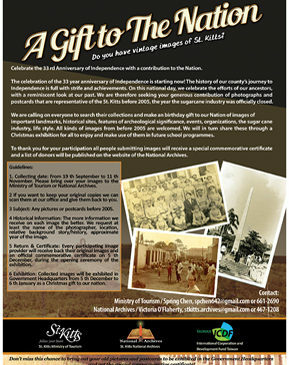 The National Archives is the official Archives of the Government of the Federation of St. Kitts. and Nevis. We are the custodian of the nation's memory; acquiring, preservice and making accessible Government records that document our nation's proud history. Because St. Kitts is a small place we collect on multiple levels. Our repository holds several small non-governmental collections such as those of churches, political parties, businesses, private schools and individuals. Our collection also come in a variety of formats. We have manuscripts and printed documents, maps and plans, photographs, magnetic tapes, optical media and newspapers. We are happy to assist any visitors interested in researching themes related to our history.